available for consumers to choose from. that meets your needs and preferences. Chainsaws are used for many things from cutting firewood to being used professionally by tree cutters. Different styles and models of chainsaws have different features that set them apart from one another. When you have the information you need and understand a little about them, it makes sorting through all the choices much easier. These top rated chainsaws are customer favorites and we will share with you the reasons they are so popular as well as give you the information on what makes them better than other models. We will also provide a buyer’s guide that will give you even more information about chainsaws in general so you understand what all the different features actually do and the purpose they serve. Knowing how to get rid of the chainsaws that don’t meet the needs and preferences you have not only saves you time, it saves money as well and prevents you from purchasing a chainsaw that isn’t powerful enough for the jobs you need it for. Even though you can return items in most cases, you really won’t know whether you like a chainsaw unless you use it if you choose one without the proper knowledge. Knowing about power, features, and capabilities of the different models makes having to try it out first much less necessary, especially if you also check out customer reviews and comments during your research. We also have provided a buyer’s guide for you that will give you even more information. With knowledge comes power and after you read these reviews and the buyer’s guide you will definitely have the power AND knowledge to purchase a chainsaw that is everything you need it to be. This hearty all around chainsaw is perfect for demanding jobs that require a chainsaw with more power for the longer 20” guide bar. It has an X-torque engine that provides high torque. It handles super easy thanks to the ergonomic body so the chainsaw doesn’t feel like it’ll get away from you. The chain tensioner is side mounted, giving users easy access to it. You will get plenty of durability for even the toughest jobs with the forged 3 piece crankshaft. Changing the air filter is simple with the quick release feature it offers, making maintenance much easier to do. This Husqvarna 460 is CARB compliant. The company is offering consumers an extension of the consumer warranty from 2 years to 4 years if they purchase 3- 32 ounce cans of the Husqvarna pre-mix fuel and register their product online. Other features of this great, high quality chainsaw include air injection, a combined choke/stop control, low vibrations and the Smart Start technology too. Gas powered for convenience and easy transporting to wherever you need to cut. No batteries to wear down or cords to worry about. The Remington Rodeo is tough enough for any job you throw at it whether it is trimming limbs or cutting firewood. Makes clean up after a storm easy and efficient with its 51cc engine and 18” low kickback bar and chain. The pro-grade crankcase and sprocket is rugged and durable and makes tough tasks simple. The Quickstart technology makes starting the chainsaw much easier so all you do is press a button rather than having to pull start it. You won’t have to worry about your arms and hands tiring fast thanks to the anti-vibration handle that makes it much more comfortable to hold and use. The solid, die-cast body is one of the many things that make the Remington Rodeo dependable and an excellent choice for any of your cutting jobs. The premium 18” bar cuts through even the most stubborn of wood types. This gas powered chainsaw comes with a convenient carry case too. 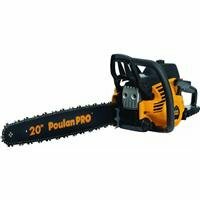 You will get the latest features available at a great price when you choose the Poulon Pro chainsaw. It starts easily with the effortless pull start system and has reduced vibration so users don’t get so exhausted from using it for longer periods of time. The 50cc Duralife engine lasts longer than other models and is the most CCs offered in any consumer chainsaw. It has a 20” guide bar and is gas powered for convenience. 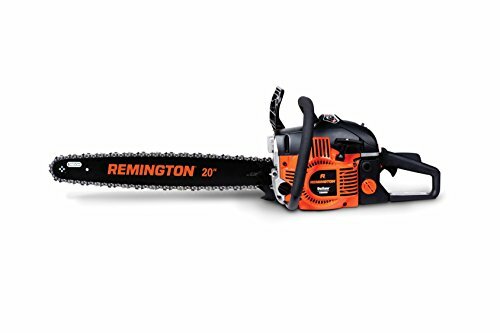 Other features of this great chainsaw include easy access to air filter and speak plug that doesn’t require any tools, aluminum professional inch style clutch cover, dual post, purge and spring assist and onboard locking screwdriver/wrench combo holder. It even has a convenient carrying case. It is the perfect chainsaw for those who have a lot of cutting to do on a regular basis and can even be used on a professional basis with good performance results. Any one of these top rated chainsaws will be a great choice for your cutting needs whether you have a lot to cut or just occasional jobs. Having a powerful chainsaw is very important so you do not burn up the motor by overtaxing it. It’s also much easier on the user to have a chainsaw that matches the type of jobs it will be used for. There is a lot more information available about chainsaws that can give you more insight into what makes them different, especially when they seem to have similar features. In the buyer’s guide below, we will go over, in detail, the most common features that chainsaws have and why you should make sure that the models you are considering have specific features. Chainsaws can be very dangerous pieces of equipment if you do not know how to use them, but there are models that are better suited to beginners. We will also cover basic safety information for you if you are a beginner so you will have the best and safest experience possible with your chainsaw once you choose one and get it home. Chainsaws were invented in the 1920s. The first types of chainsaws were huge and heavy, requiring two men to use. They were often so heavy that they needed to be moved around on wheels. It wasn’t until after WW II that the designs improved so they could be used by one person. After the design improvement, demand for the chainsaws increased at a very fast rate. The invention of the chainsaw made cutting and forestry work much easier. Today, chainsaws have pretty much replaced the outdated, man powered alternatives of using regular saws except in some competition type venues. They are used in professional forestry, landscaping, construction and by homeowners for various tasks. If you find that you are in the market for a chainsaw, there are a few things that you need to think about before you start researching models and deciding on which one you want to purchase. Reading this buyer’s guide is one thing. There are also some questions that you need to ask yourself that will help determine the best chainsaw for your needs. You can save money by not over or under buying a chainsaw so that you end up with what you need rather than something that isn’t powerful enough or that is so advanced you end up not using many of the features it offers. Where will you be using the chainsaw? – Chainsaws should not really be used indoors but sometimes the situation or job calls for it. If you will be using the chainsaw inside frequently, it is best to not get a gas powered model because of the dangers if exhaust-emitting engines inside. If you will be using the chainsaw outdoors all the time, then a gas powered model will be your best choice. It will provide not only the most power, but the most convenience as well. Why type of cutting will you be doing? – If you’re getting into heavy duty logging opt for a gas powered chainsaw which is more powerful and faster too when it comes to heavy jobs. 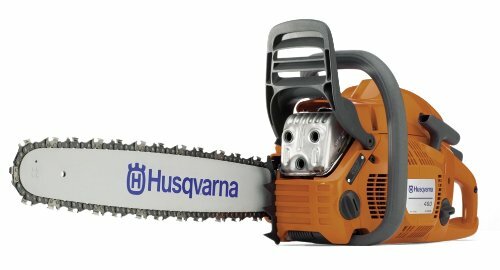 If you will only be using your chainsaw once in awhile for cutting up some firewood or clearing some branches out of the way you could get a cordless model. Gas powered will work for the lighter jobs too, but if your chainsaw will be stored most of the time, having gas sitting in it is not good for it which is why you may prefer the cordless varieties. You should get a chainsaw with a bar that is 14” to 20” long for mid size to heavy jobs and 14” or less for lightweight jobs. You should make sure that they bar is not so long that the tip hits the ground or another branch while you are cutting. There are two basic types of chainsaws: electric/battery operated and gas powered. Each one has types of cutting work that they are best suited for. We have outlined the differences below. Electric – There are small and large electric chainsaws. Small electric chainsaws are great for branch trimming and very light jobs around the home. The small chainsaws can also be cordless which makes them very easy to move around and use wherever you need to trim a branch. They do not do well with thick branches or tree trunks. They are fairly quiet as far as chainsaws go. The larger models require a power cord which, unless they are very skilled and experienced in working with electric chainsaws, can be hazardous due to the cord getting in the way and either causing tripping or potentially getting in the way of the blade and causing electrocution. They are capable of cutting through branches and logs and are much quieter than gas powered models. Gas Powered – Gas powered chainsaws are the power horses of the chainsaw world and can handle heavy cutting jobs on a regular basis. They are also the largest type of chainsaw you can buy. The fuel tanks on these chainsaws make them much heavier and awkward to carry and hold but they are still the preferred type of chainsaw due to the power and speed they have. Most people who frequently use chainsaws don’t feel that the heaviness or awkwardness is a reason to not get them when they have frequent cutting jobs that require the use of one. There are many features that a chainsaw can come equipped with that will make it even easier to use. When you are researching different models, be sure to get a model with as many of these features as you can and you will be very pleased with the performance of the model you get. Anti-vibration handles – When a chainsaw vibrates a lot it can cause your hands, arms and shoulders to become very tired and even have pain and numbness. Having anti-vibration features lessens this vibration and helps reduce user fatigue and these other problems. Side mounted tensioning or tool-free chain tensioning – When you need to adjust the chain (NOT with the chainsaw running) this feature makes it much easier to see what you are doing and makes adjusting the chainsaw much easier. Built in Circuit breaker for Electric Models – Sometimes people can inadvertently push an electric chainsaw farther than it should be and it can burn up the motor. A built in circuit breaker prevents this from happening because when it is pushed too hard it will shut itself off to avoid getting damaged. Sharp Chain – A top grade chain will improve performance even in a budget chainsaw. Keeping the chain sharp will ensure great performance also and will make the chainsaw much more efficient since it will cut much better. Anti-Kickback Chain – These types of chains are much safer for novice or brand new chainsaw users. This feature prevents the chainsaw from kicking back towards the user in the event it hits a knothole or has another problem cutting through the branch or log. California Air Resource Board Certified – Why would you want your chainsaw to be certified in CA? This has a lot to do with the air pollution that gas powered chain saws can cause. If the chainsaw you are interested in can be sold in CA the emissions are much better than those that are prohibited which means less pollution. Easy to Maintain – You want to look for features like see through gas tanks and oil tanks so you can easily see when they need refilling, self oiling chains and a tool free adjustment. A gas powered chainsaw will require more maintenance and “fussing” than an electric or cordless one will such as having to mix the gas and oil, refueling and cleaning spark plugs. You will also have to make sure that you’re storing the extra gas properly too. A Good Warranty – Federal law prohibits mailing tools that have contained fuel, even if the fuel has been drained. The best way to make sure you get a good warranty is to choose a model where there is a service center or dealer close by so you can get it worked on or replaced should something go wrong with it during the warranty period which is typically 2-5 years. If you are going to be doing certain tasks often, there can be a recommended guide bar length that is best for those jobs. The guide bar is the long part of the chainsaw that the chain is wrapped around. It can vary in length from less than 12” to 20” inches or larger. Below is a good chart that you can use to determine the guide bar length that will be best for your tasks. Safety gear when using a chainsaw should never be an optional thing. Always make sure that you are using the proper safety gear when operating a chainsaw no matter how experienced you are. Below we’ve listed the best safety gear to wear and have when using chainsaws. Chainsaws can make logging or even just tree trimming much easier so it is no surprise that these tools are so popular. There are many things to consider when purchasing the right one. In the buyer’s guide we have given you information that you can take and use when searching for the right chainsaw for your needs. They are not to be used carelessly and anyone using one on a regular basis or even once in awhile should always do so with extreme caution and respect for the damage they can do. Having a good quality chainsaw can definitely make your job easier and you will not be as tired either. Follow the safety gear section and make sure that you never allow children to be around when you are using a chainsaw. In addition, never use them in wet conditions and if you are trimming branching always, always watch fir power lines or other electrical lines; the results of hitting one accidentally can be fatal. Also always make sure that you do the proper safety measures when using one up off the ground, such as in a tree. Falling with a chainsaw is never a good thing. Once you find the model you like, read the instruction manual thoroughly before you use it so you understand the specifics of your particular model. Be safe and enjoy the efficiency and ease in which you take care of the cutting jobs around your home.